The Tim Hortons Smile Cookie campaign runs from September 17 – 23 in participating Restaurants across Canada. When you purchase a Smile Cookie in your full $1 (applicable tax not included) goes to help support the South Huron Hospital Foundation. Nationally, Tim Hortons Restaurant Owners support more than 460 local charities, hospitals and community programs through the campaign. 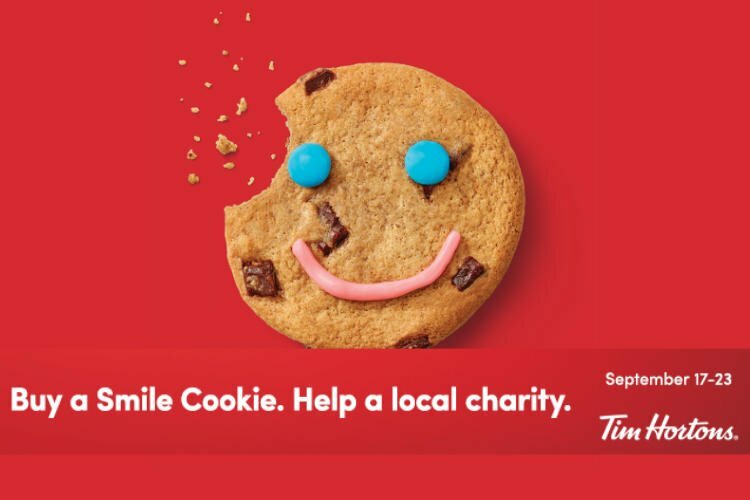 The Smile Cookie campaign began in 1996 as a way to help raise funds for the Hamilton Children’s Hospital in Ontario, and has grown to become a major fundraising event at Tim Hortons Restaurants. Last year, the Smile Cookie campaign raised over $7 million across Canada. More importantly Linda Whaling and her fabulous team at the Exeter Tim Horton’s has raised a total of $25,233 since 2006. Starting with $816.00 that first year, last year they raised a whopping $4614.00! And we want to help them do even better this year. You can help by emailing [email protected] your order form – so you can pre-order cookies and treat your office, or family or even your classroom or school bus! Big or small orders are all welcome!